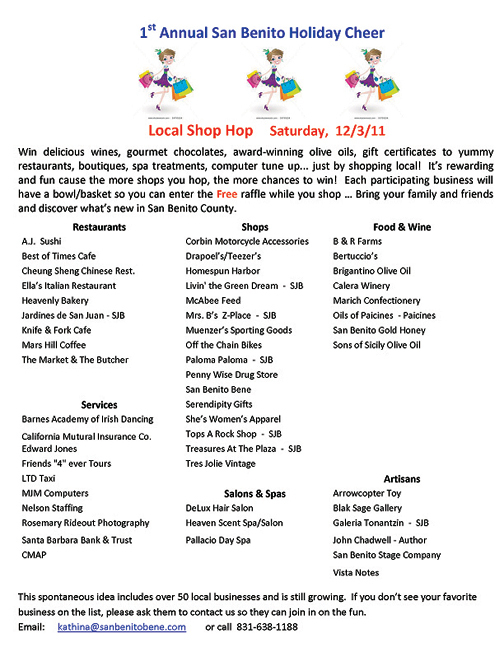 This Saturday, December 3, many of the local businesses of Hollister and San Juan Bautista will be participating in the First Annual San Benito Holiday Cheer. It is a local shop hop. To add to the fun, each business will be raffling a basket or bowl full of goodies. Sounds great! For more info, check out the flyer below, which was distributed by the Hollister Downtown Association. Double-click on it for a larger version. If you still can't read it, click here to download a copy of the flyer. By the way, San Juan Bautista will be holding its annual Holiday in Lights Parade on Saturday evening. Click here for more details. Today is the holiday bazaar that the Hazel Hawkins Hospital Auxiliary puts on every year. Some handcrafted goods, some vintage items from the Hazel Thrift Store, some new items, and a lot of good cheer. The place: The Veterans Memorial Building on San Benito Street (corner of Seventh Street). The time: 9 a.m. to 3 p.m. Lunch will be served between 11:30 a.m. and 1:30 p.m.
Strolling the shops in San Juan Bautisa is fun. So is roaming the grounds of the mission and the San Juan Bautista State Historic Park. Next time you're in the Mission City, enjoy wandering outside the usual tourist perimeter. 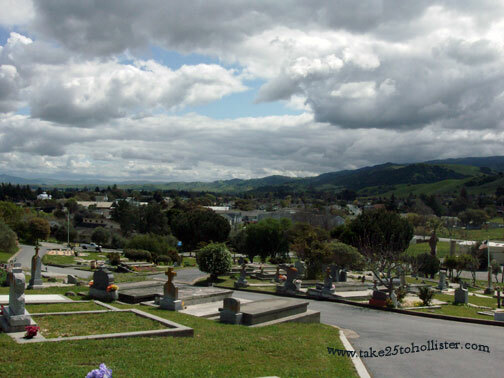 For instance, take a walk up to the cemetery at the northwest end of the city. You'll see some glorious views from up there. And, if you're into wandering cemeteries, you won't be disappointed. You'll find eroding wooden crosses marking the grave sites of unknown pioneers as well as elaborate monuments of city notables. On on the way up or down, you may see a very cool red adobe house that looks like it belongs in Santa Fe. Don't ask me which street because I don't remember. That's the surprise of wandering. This was taken in January 2011 from Fremont Peak State Park. From Fremont Peak, the Pacific Ocean looks like it's not so far away. Ha! 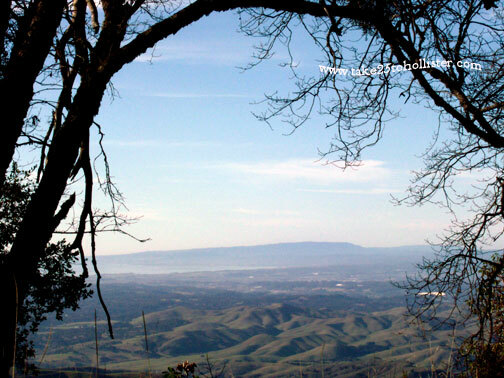 Fremont Peak stands over 3,100 feet tall, one of the tallest mountains in San Benito County. It's so worth a drive up to this small state park, which is near San Juan Bautista. The hike up to the highest point is only half a mile from the parking lot. There are a few other trails to explore as well. Before heading up, check out the Fremont Peak State Park web page to be sure it's open. California has been closing some of its parks due to lack of funds. One of the fun things about the Lights On Celebration parade is being downtown after dark. When the parade is over, people spill out to the middle of San Benito Street and stroll up and down for a while. For a look-see of parade photos, check out the album at Take 25's Facebook page. Here's the public link to it. Tonight will a great night to see them for yourself, as well as the 2011 Lights On Celebration Parade that will start at 5:30 p.m. If you don't know by now, the 2011 Lights on Celebration is an all-day event. Click this link for the schedule. 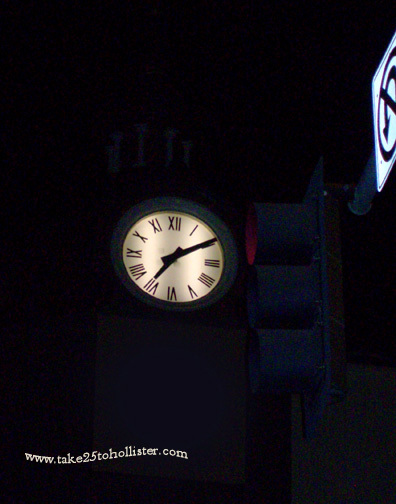 Here's another angle of the Clock Tower that I bet many of you haven't ever noticed. For other angles, check out this link. Living and working in this beautiful countryside is one of the many things that I appreciate. 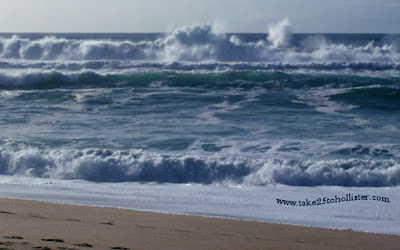 I am also thankful to you dear Take 25 readers for your virtual visits. Happy Thanks giving to you and yours. Small Business Saturday will be this Saturday, November 26. It's a wonderful alternative to Black Friday. 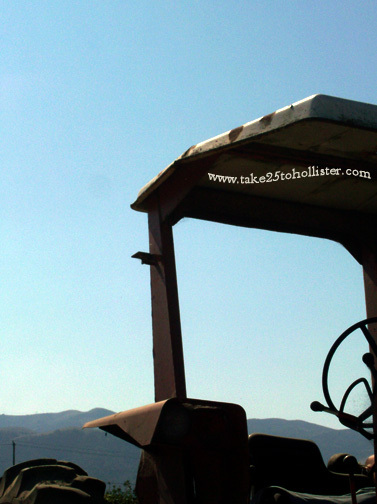 You support the shops and restaurants of Hollister and San Juan Bautista. You don't have to drive out of the county. And, if you commute daily, you get a chance to spend quality time in one or both cities. San Juan Bautista: Shop San Juan! 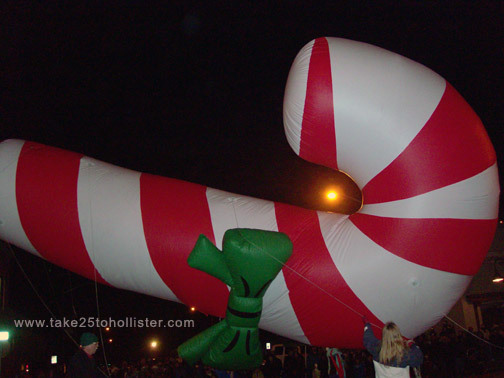 By the way, this Saturday will also be the Lights On Celebration in Hollister, which runs from 10 a.m. to until Santa and Mrs. Santa call it a night. There'll be a holiday boutique at the Veterans Memorial building from 10 a.m. to 8:30 p.m. 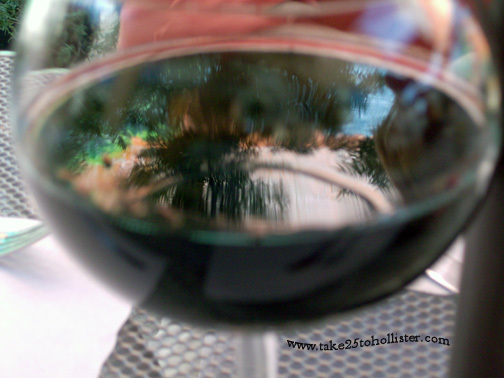 The parade starts at 5:30 p.m.
A bit of greenery and the mural reflects in a glass of wine. The Knife & Fork Cafe on San Benito Street is a great place to meet up with friends, new and old, to eat some fine food and drink a glass (or two) of wine. Sitting either indoors or outside in the alleyway is both enjoyable. Two words: lemon cake! Droooooool. 5. Every time I enter Penny Wise, I remember the aroma of the hot popcorn that was available for sale when the store used to be Roscoe, one of the five & dime stores in Hollister when I was a kid hundreds of years ago. The other one was Cornet, which is now Muenzer's on Fifth Street. I used to go out the back door of one shop, cross Wentz Alley, and enter the back door of the other shop. 4. I can usually find fun, creative, and unique gift items at the drug store, from scarves to jewelry to singing bears to jigsaw puzzles to glass giftware to baby clothes. 3. 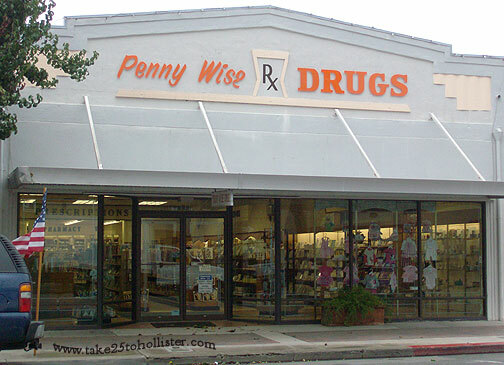 Penny Wise Drug is a local business run by the Rosati family since 1948. 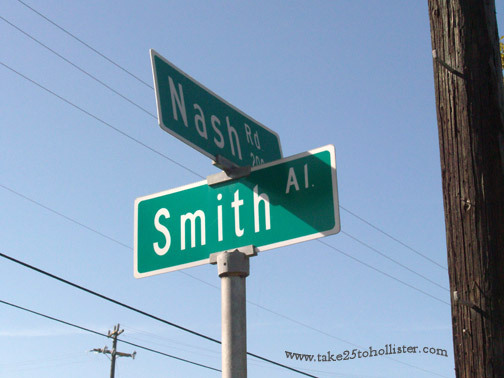 It's the only independent pharmacy in San Benito County. I like to shop locally as much as possible. 2. Customer service! One Wednesday, I went in to buy over-the-counter iron pills, but the kind I wanted had run out. Joan told her brother, Stephen, the pharmacist, to order them. I came back the following Monday to buy the pills. As I was walking towards the counter, Joan asked, "Did you remember to get the iron pills?" I went in for something else on Tuesday, and just before I walked out, pharmacist sister Jeanne called out, "Did you get your iron pills?" 1. Joan, Jeanne, Stephen, and Marie Rosati!!!! Note to FCC: I wasn't paid or given anything to write what I just wrote. So, move along. The Pacific Ocean is about 40 minutes away. Maybe less, depending on the traffic and who's driving. 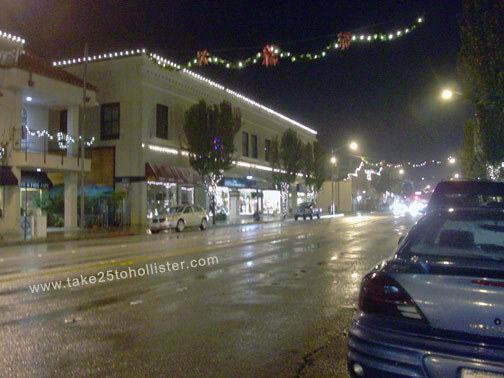 The 21st annual Lights On Celebration Parade will be next Saturday, November 26, 2011, in downtown Hollister. Sparkle, sparkle. Dear readers, take note, this year, the Lights On Celebration is a whole day and evening event, culminating with the parade. 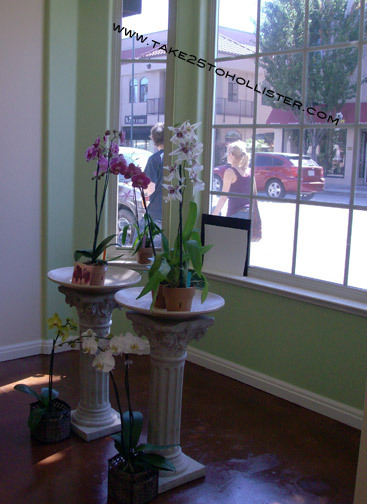 Thank you, Hollister Downtown Association, for putting this all together for our town! 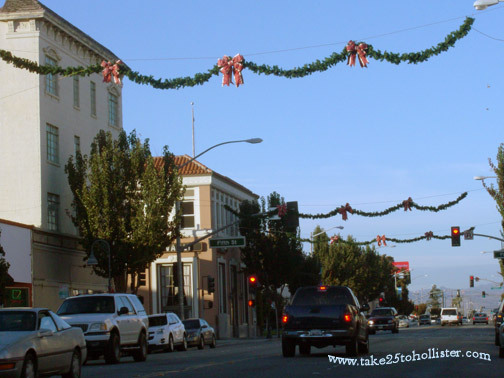 The Christmas garlands were strung up above San Benito Street yesterday. Early, no doubt. But, so what? We all need some cheer these days. The Hollister Downtown Association (HDA) is preparing for the Lights On Celebration on Saturday, November 26. This year's going to be an all day affair. There will be a car show during the day, the parade in the evening, and a holiday boutique happening throughout. Click here, for more details at the HDA's Web site. 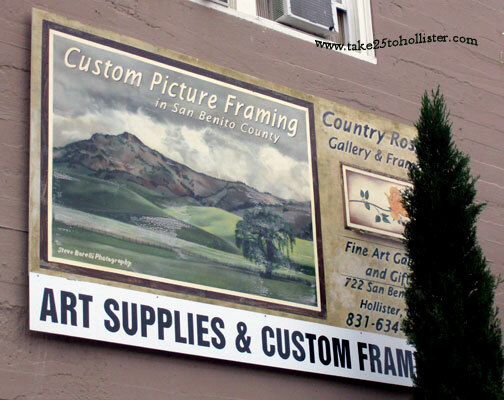 Have you ever been in the Country Rose Gallery & Frame on San Benito Street? 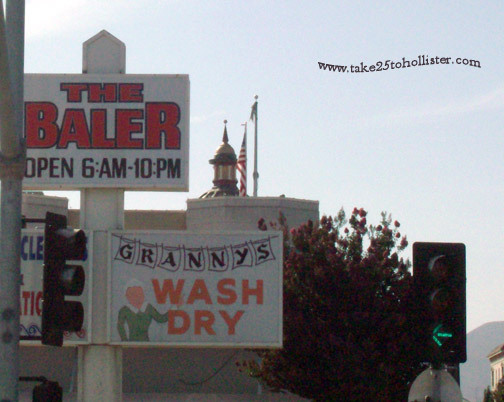 That shop right next to the gas station on the corner of San Benito & Seventh? No, I didn't think so. You don't need to be an artist or have something to frame to want or need to walk through the door. I'm not an artist, though I wish. It's the art supplies that lure me in. I'm such a sucker for pastel chalk. Christmas is around the corner. If you're willing to think outside of the box, you can find lots of great ideas for gifts or stocking stuffers there. Trust me. Note to FCC: Honestly, I wasn't paid or given anything to write what I just wrote. So, move along. 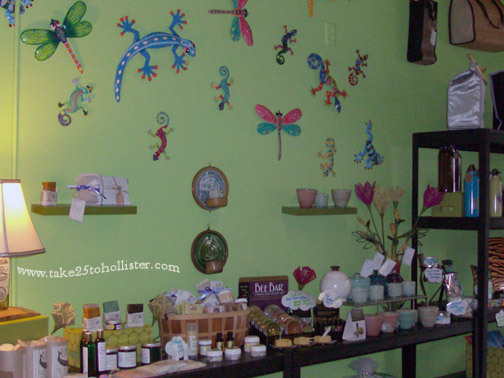 Livin' the Green Dream is a cute little shop in San Juan Bautista that sells eco-friendly products, such as glasses made from wine bottles, purses from recycled candy wrappers, soaps from goat milk, and green cleaning products. Many of the items are made in the USA, with some from the local area. I don't know about you, but I like that. I can head over there first before ordering online or driving out of the county. Livin' the Green Dream is located at 33 Washington Street, next to the Chinese restaurant. 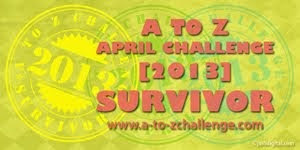 For more info, check out its Web site or its Facebook page. 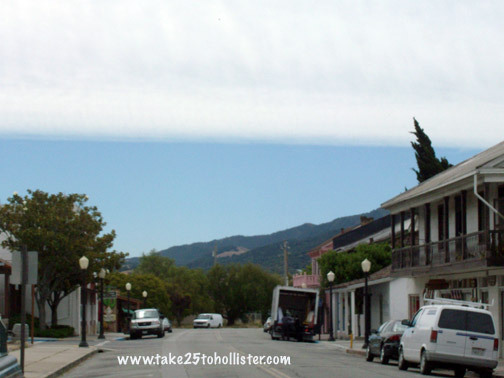 San Juan Bautista is always a great place to wander when you're into shopping for gifts. This Wednesday evening, November 16, 2011, many of the shops and restaurants in San Juan Bautista will be open from 5 to 8 p.m. to give Christmas shoppers a head start. According to a flyer I saw, many of the businesses will be offering discounts. It has begun. 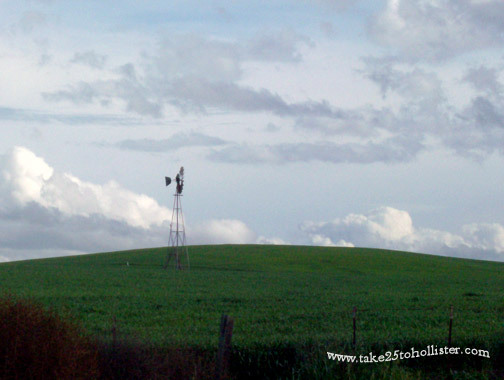 The gradual transformation of our hillsides into green. Thank you, Veterans of the U.S. military, one and all, for your service to protect us and our democracy! Yesterday was a cold and windy day. But, that didn't stop this year's Veterans Day Parade. For more parade photos, click over to the photo album at Take 25's Facebook page. 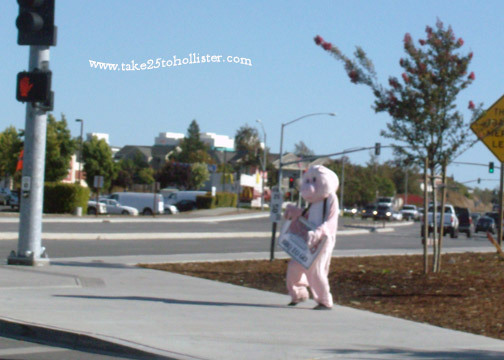 The dancing pig stands on the corner of Tres Pinos Road and Highway 25 on some Friday afternoons. She/he bounces and shimmies and shakes her/his sign at passing traffic to let folks know that they can pick up some yummy tasting Mansmith's BBQ for dinner. The Mansmith's BBQ truck is in Hollister only on Friday afternoons. The truck is not where the dancing pig is, but about a half-mile or so south on Highway 25 from where the dancing pig stands. The truck is in a gravel parking lot on the right side. Don't worry, you can't help but notice it. Do you think this is how E.T. would've transferred money to his home planet? 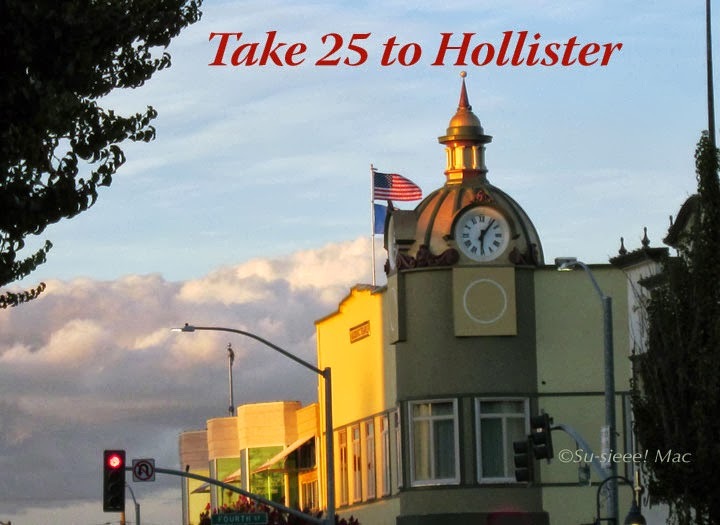 Hollister is full of whimsy. There are the robot, Sideshow Bob, a bunch of Sideshow Bobs, and that man in the tree, for instance. 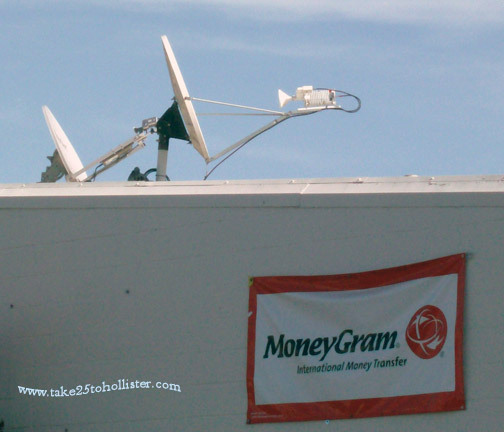 As for the money transferring satellite, you can see it in the shopping section with Goodwill on Tres Pinos Road. 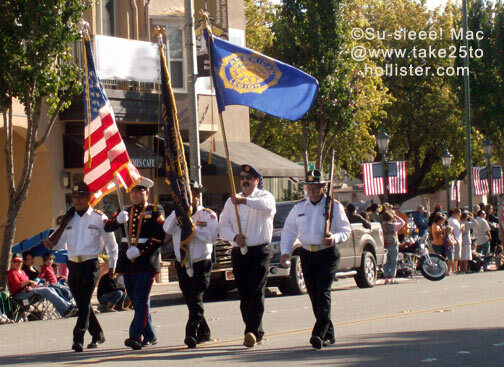 The 9th annual Veterans Day Parade will take place in downtown Hollister this Friday, November 11, at 1:30 p.m. To learn more about the parade, including its history. 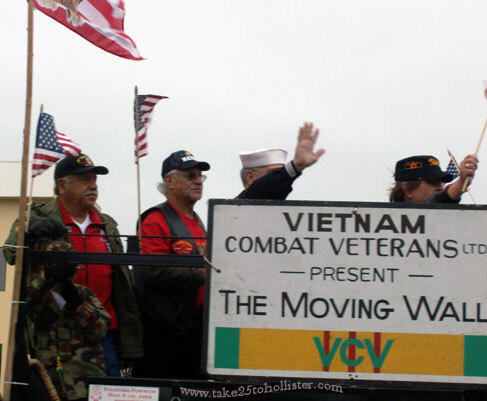 head over to this page at the Veterans Coalition of San Benito County Web site. 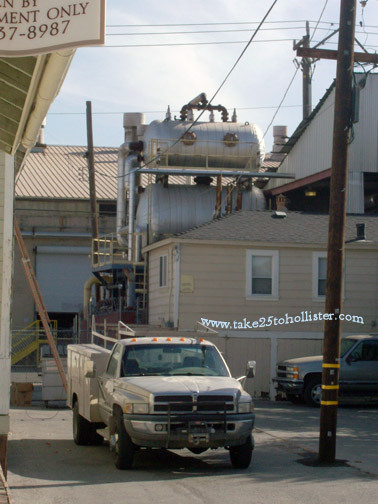 The husband and I like walking or pedaling our bikes through the alleys of Hollister. Wentz Alley is probably the most familiar of all the alleys in downtown Hollister. What? Can't place it. That's the alley where the biker mural is painted on the side of Johnny's Bar. Main, Elmore, Furlong, Hodges, Canal, Convent, Long, Swope, Grubb, and Smith Alleys are a few of the other alleys in town. Try to find them, why don't you? Recology San Benito County offers a comprehensive garbage and recycling system, which I have taken for granted. Hazardous waste, yard waste, recyclable items, electronic waste, you name it, Recology can probably pick it up or tell you where to drop it off. Here's its Web site link to access a lot of info about recycling and garbage collection. 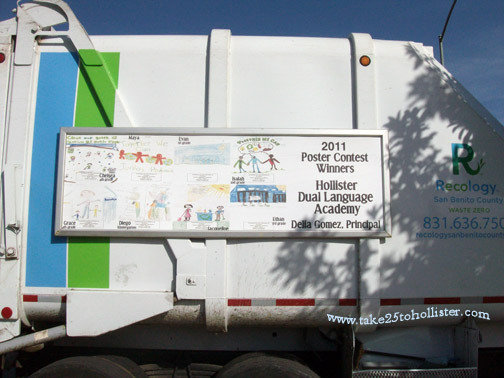 By the way, check out the sides of the Recology garbage trucks for student art work that won in its annual poster contest. The first time the husband and I walked into Super Taqueria, we walked right back out. The garbage can was overflowing and flies were buzzing around it. Gracias, pero no. That was eight years ago. Earlier this year, we needed nutrition quickly and craving burritos. since Super Taqueria was nearby, we decided to give it a try. All this time, we could've been eating yummy burritos at a rather affordable price. As for the trash problem. None that I can see. 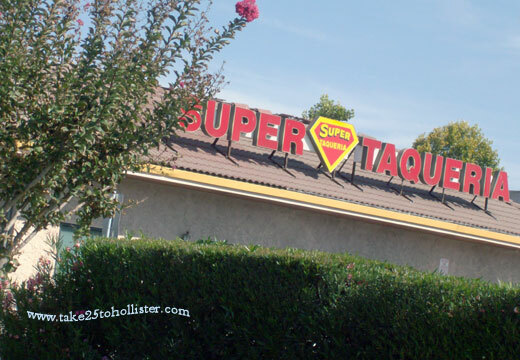 Super Taqueria is located at 460 Tres Pinos Road (north side). When I'm walking, I discover things I've missed when I'm driving, or even riding my bicycle. Who knows how long this robot has been residing down at the cannery? I wonder how many times I have quickly glanced down that driveway on San Benito Street and just saw nothing but tanks. Fresh, organic, and yummy-licious locally grown vegetables and fruit. 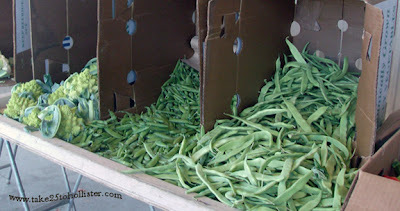 That's why the husband and I like to head over to the Pinnacle Farm Stand in San Juan Valley almost every Saturday. The farm stand is open from 8 a.m. to 1 p.m. 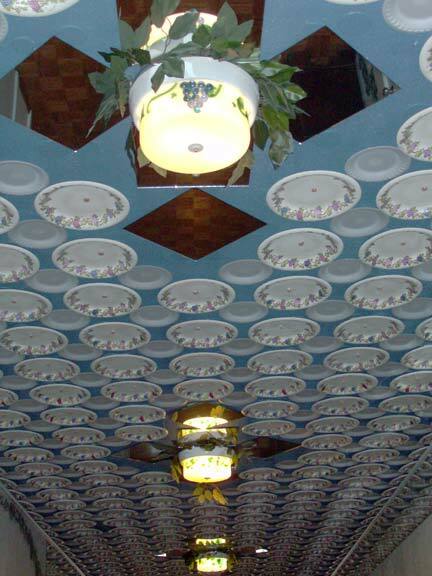 I have always wondered what it looks like inside the old Elk Lodge on Fifth and San Benito Streets. It only took me several decades to finally find out. Well, at the least the stairways. Yesterday morning, the husband and I stepped inside and climbed the stairs to the top floor. 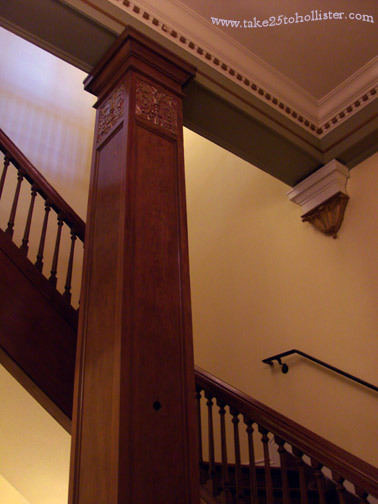 This is part of the front stairway. Beautiful, huh? It reminds me of the stairways of the old buildings on Market Street in San Francisco. The back stairway is all carpeted and modern looking. Of course, I prefer huffing and puffing up the magnificent front stairway. Just got word that Bluegrass Duets from the Bay Area, as well as local musician Rich Mortela playing at Mars Hill (San Benito and Sixth Streets) this Saturday evening, November 5. 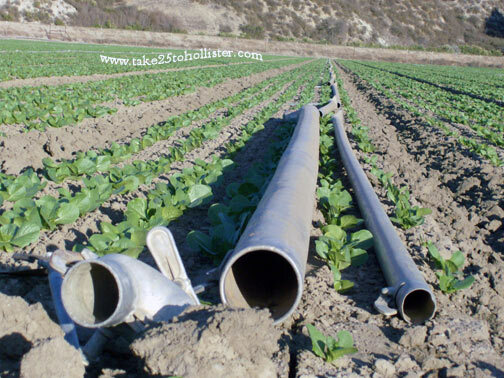 Tres Pinos is an unincorporated town in San Benito County, which is about 5 miles south of Hollister. Population of Tres Pinos is 476, according to Wikipedia. Once upon a time, Tres Pinos was a large shipping center for hay. The Southern Pacific even ran a railroad line to the town. Click here for more history about Tres Pinos. Today, Highway 25 runs through the town. There's nothing like wandering into a building I've been in more than once and seeing something I hadn't noticed before, especially when it was staring right at me each and every time. 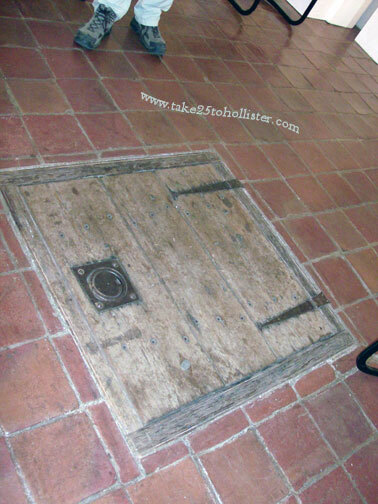 This time it was the trap door in the Galeria Tonantzin in San Juan Bautista. Duh! And, of course, I went gaga over it. Fortunately, the woman hanging out at the front counter was happy to tell the husband and me something about what was behind the trap door. It opens to a once-upon-a-time tunnel system beneath the mission city. She was told that the other end of the tunnel came out in the building where the priests live at Mission San Juan Bautista. It just made me want to know more. How about you?